Thank goodness the guessed at stormy weather did not appear while we fished at Sinclair last Sunday. Just the thought of being on the lake in a lightning storm and memories of past experiences made me shiver. But I didn’t have to hide from them. Back then, the river channel was not marked, and dangerous big mud flats were unknown to most fishermen. We spent some time working our way up the river, learning how to run it. And we caught fish. They were unpressured since few bass fishermen went up there. One muggy, cloudy afternoon we were fishing near the mouth of a small creek. It was very hot and still. Suddenly, without warning, lightning cracked nearby. We thought about running the 20 minutes back to camp, but we were afraid to try it in the wind and pouring rain that immediately started. We eased into the creek that was about five feet deep and 30 feet wide and had overhanging trees. We thought the lightning would surely hit the trees, not us, back in there. I sat up front running the trolling motor, keeping the boat in one place since the wind tried to push us out of the creek. After a half hour I noticed the boat was not moving. When I looked down, there was several inches of water in the bottom of the boat. The rain had filled it up so much the weight had pushed the big motor into the bottom, anchoring us. Finally, about an hour later, the storm moved off. We managed to pump the water out, crank up and get back to camp just before dark. That was a miserable 90 minutes, sitting in the boat hunched over and jumping every time the lighting cracked around us. The second time I was at Jackson on an August Friday afternoon, getting ready for a tournament the next night. It was just me and my dog Merlin this time. After putting in at Kerseys in the middle of the afternoon, I had found some fish biting on a point up Tussahaw Creek, but I wanted more than one place to fish. About an hour before dark I ran to the dam to fish a point right beside it. The afternoon had been hot and muggy with thick clouds, but no rain fell. I guess those conditions should have warned me. A little before dark wind started howling over the dam and rain started coming down in the proverbial sheets, blowing over the dam like a waterfall in reverse. Within seconds lightning started. There was no flash then a pause before the thunder. There would be a flash – crack – boom all together, indicating the lighting was on top of me. Back then there was no buoy line at the dam, so I eased the boat right against the concrete. It rose 20 feet over me and I thought the metal railing and walkway on top of the dam would protect me like a lightning rod. I put the front of the boat on the rocks and got down in the driver’s seat, wanting to be as low as possible. Merlin had the same idea. She huddled under the console at my feet. I wanted to join her! We sat like that over an hour, twitching every time the lightning popped. Finally, about an hour after dark, the storm moved off and we went back to the ramp and headed home. Another miserable night! This entry was posted in Fishing Ramblings - My Fishing Blog, weather on March 25, 2019 by ronniegarrison. This time of year produces weather that I hate. For most of my life lightning and tornados have terrified me and both are way too common in March. When I was 12 years old a couple of us boys “camped out” on our big screened in porch. During the night a big thunderstorm hit and produced constant, bright flashes. Although I was completely safe, it scared me badly. Since that night my heart beats faster and I want to find a safe place in storms. Last Friday I drove to Anderson, South Carolina to meet a Clemson Bass Team fisherman on Saturday to do an article on Hartwell. Sunday, I left and drove I-85 to Montgomery to meet an Auburn Bass Team fisherman to do article on the Alabama River on Monday. Passing through Atlanta around noon I hit rain. It was not bad and did not slow me down much. But it got worse the further I went. The rain was so bad in places it was hard to see, and many drivers stupidly drove less than 30 miles per hour with their emergency flashers on, even in the far-left lane. Others pulled to the side of the road trying to wait for better weather. About 20 miles from Montgomery, just after passing Talledega, brake lights ahead warned me traffic was stopped. All lanes came to a complete stop. Suddenly, my cell phone screeched with a weather alert. When it looked it was a tornado warning. The rain was pouring, and the wind started rocking the truck. My concentration went to the ditches on both sides of the highway. I was looking for the safest place to hide. Traffic started crawling along, and I gradually got to the wreck blocking the left lane. Several law enforcement vehicles with blue lights flashing sat in that lane. As I went around it, I wondered if a faster moving car had come up on one barely moving in the left lane. More that two cars were involved. Although the wind and rain continued, I made it to Montgomery without any other problems. The next morning, I saw the news about the tornado that killed so many people less than 20 miles from where I had been sitting on the interstate. My heart still beats fast when I remember the wind and how close I was to the death and destruction. The fishing trips were not very successful. It was a pretty day on Hartwell, but there was a big high school tournament with about 200 boats in it that Saturday. They were everywhere, fishing places we wanted to put on the map for the article. We saw a couple of them catch bass while we were near them. We fished a couple of places and caught some small spotted bass, but that was it. I was impressed the college fisherman would not get close to them. He was polite and courteous, which is unfortunately rare for many younger fishermen. I was warned the Alabama River was running high and muddy, and fishing would be tough. But it was worse than expected. The water was eight feet high and the current so strong the boat at idle speed pointing upstream would actually go backwards downstream. We tried to fish a couple of places but if the largemouth were shallow they were so far back in the woods we could not get a bait to them. And on the main river the spotted bass were probably hunkered down deep behind a break in the current and our baits swept by over them. Even with a heavy jig, the current swept it away too fast. The wind and cold made it miserable to be on the water, too. We did not stay out long. The warm weather we had in February worried me. If it warms up fast, it seems we have violent weather in March. That has been the pattern during my life. This weekend is supposed to be very warm, but thunderstorms are predicted. The Flint River Bass Club is on Sinclair Sunday and I expect to spend at least part of my day hiding under bridges and docks. This year reminds me of 1975. It was the first spring after I bought my first bass boat and the last two weeks of February that year were very warm. I had ordered two plugs, Deep Wee Rs, that had just been introduced. Linda and I went to Clarks Hill the last weekend in February. In two days, we landed 78 bass, including one over six pounds and another just under five pounds, on those two plugs. We found them feeding on three points near our place at Raysville Boat Club. On one of them, a hard clay point, Linda caught most of the fish on her brown crawfish plug. On another, my chartreuse plug caught most of the fish. It was covered in white gravel and I think shad were the main food the bass were eating. On the third, a combination of rocks and clay, we caught about the same numbers. Catching all those fish was fun. It got to the point we could call our bites. If we cast across the point at the right angle, as soon as the plug bumped the bottom we would get a bite. We would say “There’s the bottom, and there’s the fish,” each time we made the right cast. Fish were constantly reloading those points that weekend. We would go to one, catch four or five then go to the next one and catch four or five. We rotated through them constantly all day both days. I have caught a few fish on those points over the years but never those kinds of numbers again. Maybe someday. This entry was posted in weather on March 15, 2019 by ronniegarrison. Though hurricanes can be hell for human residents of coastal areas, a new Texas study seems to indicate that they are not harmful to inshore fish, and may even be helpful. Figure 1. Catch rates of red drum and spotted seatrout in TPWD fall gill nets. Figure 2. Angler catch rates of red drum and spotted seatrout. On August 25, 2017, Hurricane Harvey made landfall as a category four storm in the small fishing community of Rockport. Winds as high as 150 mph and a storm surge in excess of seven feet battered the town before the storm moved inland and unleashed record-breaking quantities of rain along the Texas coast. The economically important commercial and recreational fisheries were certainly not spared from the devastation left in the wake of this historic storm. A preliminary assessment conducted by Texas Parks and Wildlife Department (TPWD) and the National Oceanic and Atmospheric Administration (NOAA) estimated that damages to the state’s fishing operations and fishing-related businesses exceeds $58 million. It’s well-documented that major storms like Harvey can have lasting effects on estuarine communities. The greatest threat to shallow-water species is the rapid disruption of normal salinity regimes via highly saline storm surges followed by excessive freshwater inflows. Paired with increased organic loading, these hydrological changes can result in low-oxygen conditions that trigger fish kills. Fortunately, for the Aransas Bay system, these changes were highly localized and relatively short-lasting. Hurricanes also impact the habitats that marine species rely upon. In the Coastal Bend, many oyster reefs were broken up by intense wave action and, in some spots, buried under thick layers of silt and debris. Seagrass beds, mangroves, and salt marshes also suffered considerable losses due to high winds and powerful waves. It will be quite some time before we fully understand how the effects of this habitat degradation propagate up the food chain. Fortunately, data from TPWD monitoring programs indicate that the immediate impacts on popular bait species (i.e. blue crabs, shrimp, and Atlantic croaker) were minimal. Currently, recreationally and commercially important finfish appear to have actually benefited from the storm. Relief for these species comes by means of reduced harvest pressure. Local anglers were preoccupied with recovery and repairs and faced numerous obstacles to wetting a line in the wake of the storm. Public access to the bays was limited as boat ramps and fishing piers were damaged, and losses to private and for-hire vessels was extensive. Significant damage to bait stands and commercial shrimp boats also made bait difficult to procure. Lastly, visiting anglers struggled to find hotel accommodations in the months following Harvey. To monitor fishing pressure and total landings, TPWD routinely conducts angler surveys and trailer counts at boat ramps. In September 2017, we documented an 85% decline in boating activity in the Aransas Bay system compared to 2016.We intercepted an average of only two fishing trip interviews per survey, down from 16 the previous year. In fact, more than half of September’s angler surveys had no fishing trip interviews. Fishing activity bounced back over the next few months, but still remains below average. So what impact did reduced angler pressure have on our local fish populations? To answer that question, we looked at data collected during TPWD’s biannual gill net sampling program. For our two most popular game fish, spotted seatrout and red drum, the results were extremely promising (Figure 1). 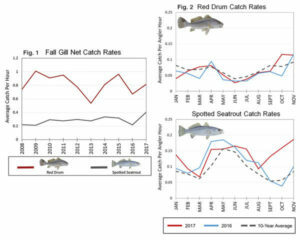 In the months following the storm, red drum were caught in the nets at a rate of 0.81 fish/hr, up from 0.67 fish/hr in 2016 and close to the 10-year average. Spotted seatrout were caught at a rate of 0.41 fish/hr, a huge improvement over 2016 (0.22 fish/hr) and the 10-year average (0.29 fish/hr). This data implies that these species are actually more abundant in Aransas Bay following Hurricane Harvey. Moreover, data collected at angler surveys indicates that the higher abundances track well with higher catch-rates for sports fishermen (Figure 2). Anglers were landing red drum at higher rates in September 2017 compared to the previous year, and at much higher rates than the 10-year average in October and November. Spotted seatrout were being caught at roughly twice the rate as the previous year and the 10-year average from September through November. Though still too early to say conclusively, it appears as though these trends have continued into the spring. To better understand the long-term effects of Hurricane Harvey, TPWD will continue to closely monitor our fisheries in the coming months and years. Though we usually perceive hurricanes as purely destructive, it’s important to note that they are a recurring natural force acting along the Gulf of Mexico. Our ecological communities, including our highly-prized finfish, have evolved and adapted in response to these large storm systems and, as our data shows, can actually benefit from the occasional disturbance. Recovery efforts in Rockport and the surrounding areas are making daily progress, and the local fishing community is gradually returning to normalcy. Boat ramps, marinas, bait stands, and fishing guides are rapidly getting back to business, partly due to funding set aside for Federal Fisheries Disaster relief. So if you find yourself with that burning desire to bend a rod, grab your fishing license and head down to the Coastal Bend. Aransas Bay is open for business and the bite is on! This entry was posted in Conservation, weather on December 18, 2018 by ronniegarrison. Four trips in the past week were fun but the weather was very different on each. I’m glad I now have suitable clothes for all kinds of weather. At Lake Martin in Alabama last week, it was very cold and the wind howled all day. But Anthony Vintson, an Auburn Bass Team fisherman, showed me how to catch a lot of bass there for a January Alabama Outdoor News Map of the Month article. On Friday Tucker Sweat, a Georgia College Bass Team fisherman, showed me how he catches bass on Sinclair in January for my Georgia Outdoor News Map of the Month article. It was a beautiful day, warm, sunny and calm. Very different from the Tuesday three days earlier. On Saturday the Potato Creek Bass Masters fished our December tournament at Jackson, the last one this year. It poured rain all day and was cold. Then on Sunday the Flint River Bass Club and the Spalding County Sportsman Club fished a two-club tournament at Jackson for our last tournament this year in those clubs. It was warm all day and sunny after about 10:00 AM. That is four totally different weather conditions on the lake in just six days! In the Potato Creek tournament, after eight wet hours of casting, 17 competitors brought in 43 keeper bass weighing 80 pounds. WE don’t keep up with numbers of spots but almost all I saw were spotted bass. Niles Murray came back strong from his medical leave to win with five wedging 12.14 pounds, Doug Acree placed second with five at 9.96 and had big fish with a 4.69 pounder, Tom Tanner was third with five weighing 9.75 pounds and Buddy Laster came in fourth with four weighing 9.12 pounds. Everything I did was apparently wrong. I caught a keeper spot on a crankbait 15 minutes after blast off and thought I was on something, but two hours later I had not had another bite. I went back to the truck to try to find some dry matches and went back to where I started. I caught a keeper largemouth beside the same rock where the spot had hit over two hours earlier. It hit a shaky head worm. Although I didn’t ride around a lot in the rain, I fished a variety of places with different baits but never caught another fish. On Saturday, 16 members of the combined clubs fished for eight hours to land 37 keepers weighing about 56 pounds. There were only 12 largemouth weighed in. Four people had five-fish limits and there were five zeros. Raymond English won with five at 10.49 pounds and had one of the biggest spots I have seen from Jackson, a 4.23 pounder, for big fish. Billy Roberts placed second with five at 7.92 pounds and Jay Gerson placed third with five at 5.70 pounds. Thanks to a tip on Saturday to use a smaller crankbait, I had five weighing 5.28 for fourth. Of course, Billy said he beat me with a very big crankbait. Both days the water was stained a little and in the low 50s. That is usually a good combination this time of year, but fishing was tougher than hoped, as always. This entry was posted in Bass Fishing, weather on December 17, 2018 by ronniegarrison. Thanksgiving, Weather and Climate Change? Thanksgiving came really early this year. A results of climate change, no doubt. On a more serious weather note, we had our first freezing weather this past Tuesday, November 25. That is a little later than the average, since the historical average is on November 11. But the first freeze here on record was October 14, 1988. The latest was December 26, 1918. We were well within that range. Weather and climate change. Weather changes day to day to day and even hour to hour, but climate change is a long-term trend over many years. No doubt it is changing, but how much is man made is open to debate unless you have an agenda and insist the science is “settled.” Real science is open to adjustments based on new information, and almost all science has changed over the years. The day after Thanksgiving the National Climate Assessment (NCA) was released. This gloom and doom report, based on their computer models, came from government agencies with agendas. Their recommendations were that everyone sacrifice our lifestyles to avoid perceived catastrophes. 1. The report claims climate change will cost the US economy 10 percent of gross domestic product by 2100. But that projection is based on our climate being 15 degrees warmer by then. That is a guess way beyond even the UN’s guesses from the International Panel on Climate Change. That group guesses the change at that time will be less than one-fifth, or just under three degrees, of that. 2. The NCA predicts more hurricanes, floods and wildfires. But last year, in the annual report for that year, it shows no increase in any of those. This has been a bad year for all three, they claim, but one major hurricane does not make a trend, and a state mis-managing their forest to protect endanger species, leading to worse wildfire dangers, does not equal climate change. The NCA also uses timelines for their projections with arbitrary starting and ending dates, cutting off their information to show trends longer term timelines do now support. 3. The NCA report would lead to the IPCC recommendation of a huge carbon tax by 2030. That would increase your electric bill so much you could not afford to run air conditioners, heaters or most electric appliances. And your gas would cost would go us so much you could not afford to drive. I will pay attention to the doomsayers when they lead by example. As soon as they walk or ride horses everywhere they go and stop all use of electricity produced by fossil fuels, including that used to charge their electric cars, I may pay a little more attention to them. Last Thursday it was 27 degrees at daylight but 60 by 3:00 PM, a change of 33 degrees. But I didn’t see dead animals everywhere from that drastic change. The lake water at Lake Martin dropped five degrees last Tuesday in the six hours I fished, but dead fish didn’t float to the surface. Like wildlife, we adapt to daily changes much more drastic than the projections from government agencies wanting to spend our money and make us change our lifestyles while not changing their own. This entry was posted in weather on December 5, 2018 by ronniegarrison. I always get a kick out of the claims of a true believer in whatever the current name for weather. They call me a “skeptic” or “heretic”, reinforcing my use of the term “true believer.” So far, they don’t demand I be burned at the stake, maybe that would produce too much carbon! Both sides have scientific information on their side but ignore or make wild claims about the science they think supports the other side. But only one side, the true believers, claim the science is settled. Science is never “settled,” new information changes it. After all, in the early 1400s settled science said the earth was flat, and in the 1970s it said we were due for another ice age by the year 2000 if we did not make drastic changes to our lifestyles. Sound familiar? Degree I had to write a research paper on global cooling. The “settled” science then said our lifestyles had to change and we had to spend billions of other peoples’ money to avoid a new ice age, with glaciers covering half of the US by the year 2000. When that “settled” science didn’t work out too well for them they changed the name so it would fit any weather we had. A few weeks ago, two research scientists, call them skeptics, won the Nobel Prize in medicine for their breakthrough research that found an enzyme in cancer cells fools our immune system into thinking the cancer is normal cells. They have been able to deactivate this enzyme in mice and the tumors were killed, offering new hope for a new cancer treatment that goes against 100 years of settled science. My biggest problem with true believers is their claim that “common sense” demands the government spend billions of our tax money and we make drastic changes to our economy and lifestyles. The problem with using the term “common sense” tries to imply those that disagree are totally wrong, and any cost is worth it. The U.N.’s Intergovernmental Panel on Climate Change said that efforts to stabilize levels of greenhouse-gas emissions would require investments of about $13 trillion in the next 12 years. It also noted that reducing emissions would reduce the rate of economic growth, costing much more in the long term. Just the cost of switching from carbon fuels to alternative energy sources would cost 44 trillion between now and 2050. That report does not mention the problem of reliability of alternative energy, the more dangerous smaller vehicles, and lack of and inability to accomplish some goals. For some, a tiny tin can car may be fine, but if you hunt or fish, especially if you pull a boat or trailer, they do not work. Some will say we have to make sacrifices, but they almost always want others to make those sacrifices. Every time I see celebrities and politicians with private yachts and jets say I need to cut back on my carbon use I can only shake my head. One cross Atlantic trip for them to attend a climate conference in their jet uses more carbon that I will in a lifetime of fishing and hunting using my truck and boat. Just like they want to spend my money, they want us common folks to change our lifestyles while they live in luxury, changing nothing. And they demand we make those changes immediately, before their “settled science” changes. Another “settled science” claim is low lying islands will be uninhabitable due to melting glaciers causing sea level rises. They say sea levels have risen about 8 inches in the past 150 years and are predicted to rise another sixteen to 48 inches in the next 100 years. But almost every example of this I could find says the islands are getting smaller due to sea level rise AND erosion. A 2017 study by Duval and other looked at 111 islands “threatened” by sea level and erosion changes. Their study covered the past 50 years and found only nine that had actually gotten smaller. Fifteen had gotten bigger, with the vast majority not changing. All this claim of change is based on computer models of our climate. But those models are only as good as the programmer writes them, and they depend on data input that can be manipulated. If you have a computer, you know how unreliable they can be. Auto spell correct is a computer model on your phone. How accurate is it? I took a cruise up Glacier Bay National Park a few years ago. The naturalist told us the open water in the bay was 110 miles long. In 1764 when it was discovered it was covered by glaciers. They had retreated 110 miles in just over 250 years. And the fastest retreat took place from 1860 to 1870. I guess it was all those Civil War SUVs! There are 1045 glaciers in the bay and some of them are growing, not retreating. Why? They are not affected by climate change? If our settled science is correct, our environment has always changed and probably always will. I have seen a lot of different weather in my 60 plus years outdoors, but climate changes very slowly, not fast enough for a person to see. This entry was posted in Fishing Ramblings - My Fishing Blog, weather on November 2, 2018 by ronniegarrison. As soon as Hurricane Florence started looking like a major storm, the global warming fanatics started their usual mantra that their favorite belief would mean more, bigger, stronger, fatter, terrible hurricanes every year unless we immediately change our lifestyles and spend massive amounts of other peoples’ money. Those true believers just make themselves look even more silly by such hyperbole but they do it every time. Remember Hurricane Katrina in 2005? Those exact same claims were made then. But there was not another major hurricane that hit the US for seven years, until Hurricane Sandy hit us in 2012. They again started their claims after Sandy. Those fanatics claim folks like me are “skeptics,” and seem to want us treated like the Catholic church treated heretics in the middle ages. They say we must accept their version of science, but they ignore anything scientific that disagrees with their belief and condemn those that point this out. A simple Google search shows hurricanes have actually decreased over the past 100 years, and that is with better observation and reporting availability. There are all kinds of data out there, interpreted in many different ways. But one chart, showing hurricanes striking the US by decade, shows fewer since 1950 than in any other time since 1850. Others show the same thing, with major hurricanes coming in groups, with four to six years between cycles. Al Gore predicted Lower Manhattan would be under water by 2015. ABC “News” in 2008 repeated that claim and also said gas would cost more than $9 a gallon and milk $13 a gallon by 2015, all due to global warming. In his doomsday movie “An Incontinent Truth,” Gore showed a glacier calving and used it to show how glaciers were rapidly retreating now due to global warming. I have been to that glacier in Glacier National Park and watched it calve. The naturalists on board told us that glacier had retreated 110 miles in the past 100 years, the fastest retreat taking place between 1860 and 1870. I guess it was all those civil war SUVs! I took a picture of water flooding off my roof while looking at the “prediction” of zero chance of rain for at least the next six hours. Yet those same folks that can’t look outside and tell if it is raining try to make us believe they can predict two tenths of a degree temperature increase 100 years from now. I wish I still had the paper I had to write in 1975 for an Environmental Science class I took while working on my first Masters Degree. “Settled” science at that time proved we were entering a new ice age, due to man’s activities. The cure? You guessed it. Same as now, change our lifestyle drastically and spend lots of other people’s money. I have seen a lot of weather changes over my life. But I have not lived long enough to see climate change, it takes place over thousands of years. Hurricanes are destructive and dangerous. Weather can kill you. We should take its dangers seriously, but weather is a short-term event and it does change drastically day to day and year to year. I will remain a climate change “skeptic.” I hope it does not reach the point where the true believers burn me at the stake for disagreeing with them. This entry was posted in Fishing Ramblings - My Fishing Blog, weather on September 18, 2018 by ronniegarrison. Two trips last week indicated this winter is not going to be a warm one. I went to Jordan lake near Montgomery Alabama on Wednesday to get information for an Alabama Outdoor News article then went to Jackson on Friday for information for a Georgia Outdoor News article. Wednesday was not terrible. I met Nate Johnson at 8:00 AM and, while waiting at the dock, debated if I needed my heaviest clothing. I was fairly comfortable standing on the dock in my jacket, but the wind was growing stronger so I decided to put my Cabellas Guidewear suit on. The weather guessers said the wind would be calm by 10:00 AM but I know better than trust their predictions. The wind never calmed down, it just got stronger. And blowing across the 51-degree water made it feel even colder. And the fish did not bite. Nate has won several January tournaments there in the past with five bass weighing over 20 pounds total, but neither of us hooked a fish that day. Our excuse was the water had come up over a foot and gone from very clear to stained almost overnight due to the heavy rains. And the water temperature dropped a couple of degrees due to the cold nights and wind. All those things can make fishing tough this time of year. Friday I met Willie McMullen at Jackson at 7:30 and had no doubt I needed my Guidewear. Willie grew up on Jackson Lake and his father Wayne and uncle Ronnie McMullen were well known for their great catches on Jackson. Before he died a few years ago Wayne taught Willie everything he knew, starting him tournament fishing over 30 years ago when Willie was only nine years old. Last weekend on New Years Eve Willie won a tournament at Jackson with five bass weighing almost 15 pounds. But once again the changing weather and lake level changed the fishing. He landed four bass in the seven hours we fished but I never had a bite. I was too busy taking notes and pictures to fish – that is my excuse and I am sticking with it. To anyone other than a diehard bass fisherman, we were crazy to fish on a day when the high temperature was in the mid-30, it was cloudy and rainy and snow was in the forecast. But to me it was the perfect kind of day to fish this time of year. 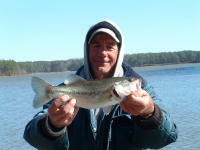 Low pressure and clouds often mean the bass bait good in the winter. One Christmas this was proved to me at Clarks Hill. I got up that morning to find my boat parked at my mobile home at Raysville Boat Club covered with six inches of snow. I raked enough off the front deck to get to my trolling motor foot control and to stand without slipping down. After putting the boat in I idled out to a point where I have caught fish in the past in January. The wind was howling as a cold front move in and the air temperature was in the low 30s. The water temperature was about 50 degrees. For two hours, every time I dropped a spoon down it never got to the bottom. I landed hybrids, stripers, largemouth bass, white bass, white perch and crappie from that point. Since my live wells were frozen shut I just threw the fish in the snow in the bottom of the boat. When I went in I had to climb over the windshield to get to the drivers seat. I quit fishing because as soon as the wind blew the cloud cover away and the pressure jumped up the fish stopped biting. I kept trying for about 30 minutes after the last bite but they were just gone. Another Christmas the wind was blowing sleet sideways one morning. I tried to fish some points but it was just too cold and rough, so I idled behind an island where the bank dropped off fast into deep water and was covered with rocks. And best of all I was out of the wind. Within a few minutes, I hooked and landed a bass weighing just over eight pounds on a Deep Wee R. After landing it I decided I had used up my luck and headed to the ramp and a warm mobile home. Don’t let cold, windy, cloudy weather keep you home this winter. This entry was posted in Fishing Ramblings - My Fishing Blog, weather on January 15, 2017 by ronniegarrison. I guess if the unusually warm weather on Christmas Day proves global warming, the weather this past weekend proves global cooling. Weather and climate change. Always have, always will. In 1975 I was working on my first Masters Degree at West Georgia College and took a course titled “Environmental Science.” I had to write a report on the coming ice age. All the scientific “evidence” proved that half of the US would be covered by glaciers within the next 25 years. To prevent this catastrophe US taxpayers had to ante up billions of dollars for changes. And we had to change our lifestyles to keep polar bears out of downtown Chicago. Just like the Italian scientists of his time told Christopher Columbus, the science was settled and they would not fund his trip because he would fall off the side of the flat earth. I fish year-round and some winters water temperatures stay in the 50s. Other years lakes around here drop into the low 40s and I have seen Jackson lake with solid ice sheets in some covers and a thin layer of ice on parts of the main lake. I have also seen years when there were few days when fishing with only a light jacket was not enough. I enjoy warm winters, it is much more fun fishing when you can actually feel your fingers holding a rod and reel, and when you don’t have to dip your rod into the water every cast to melt ice out of the guides. That was the way it was during the winter three years ago. I hope it does not get that cold this winter. This entry was posted in Fishing Ramblings - My Fishing Blog, weather on January 12, 2017 by ronniegarrison. You just gotta love this global change warming climate thingie. I picked ripe tomatoes and peppers Thursday, December 8, 2016 since the weather guessers said the temperature would dip into the upper 20s Friday morning. My tomato vines were still lush and covered with green tomatoes. They were still blooming! The latest I can ever remember picking fresh tomatoes is December 1. It takes only a light freeze to kill the vines and that often happens around Thanksgiving, but this year, even though the “official” Griffin temperature Friday morning was 28, my vines were still fine and the temperature at my house at 8:00 AM was 33 degrees. Maybe I picked them too soon! I got a greenhouse a couple of years ago but was too lazy to put it up. Now I wish I had done so. No telling how long I could have tomatoes this year. Warmer temperatures here show global climate change, according to some, but I had ice on my windshield on a trip to Detroit on November 1 and some northern states have several feet of snow on the ground right now, so the change must not be too global. This entry was posted in weather on December 14, 2016 by ronniegarrison.